Next up, after a quick sprint to St Julien, were the Léovilles – Las Cases and Poyferré. First up was the Delon range at Château Léoville Las Cases. These looked good with the tell tale freshness and energy of the vintage coming through. Château Potensac was attractive and vibrant Médoc, not as knockout as 2016, but everything was present and correct. Clos du Marquis always stands out and again this looks impressive St Julien in the vintage context. Château Léoville-Las-Cases itself was evidently deep, with plenty of texture and structure but felt a little closed on the day. 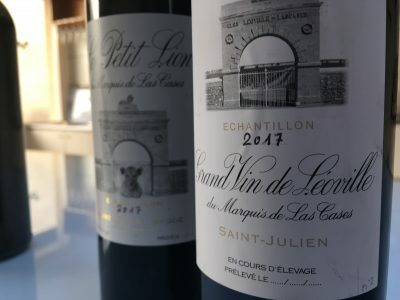 The Delon’s Pomerol property Château Nénin looked good, and there has been much improvement here over the past decade. 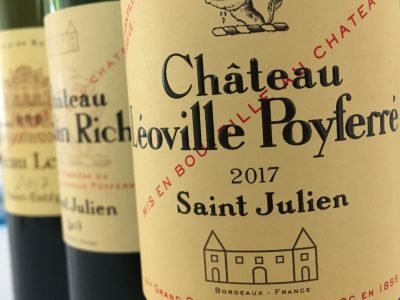 Over the road at Château Léoville Poyferré, it turned out to be Didier Cuvelier’s last day before retirement as general manager and tour de force at the property. The changes Didier has overseen in the 40 years here have been impressive. He’s certainly earned the golf he’s evidently looking forward to. I found Château Léoville Poyferré 2017 pretty and plush with delicacy. Château Le Crock looks good, another indicator of the strength of the vintage up in St Estèphe. 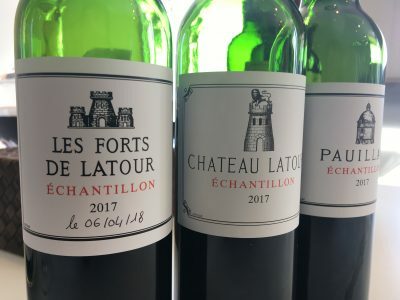 Next was, Château Latour. This is always a mouth watering prospect, more so since they left the primeurs system in 2011 and provide you with the current releases to taste. Latour 2017 looks very correct here. There is structure and intensity, and the wine has wonderfully enticing blackcurrant cassis notes. The tannins are beautifully refined. Les Forts also impressed [lovely perfume] as did the regular Pauillac bottling. No real frost damage here, except for a few areas outside the Enclos. The tasting conditions by mid morning were superb – it felt like a summer’s day – although the vineyard still looked somewhat dormant outside, the product of a winter of almost continual rain. 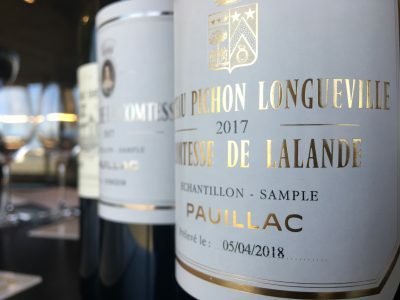 Amongst the latest releases at Latour were the 2013 Pauillac. It shows just how Latour often pulls a rabbit out of a hat in tricky vintages. The Les Forts de Latour current release is the 2012. This is itself perhaps indicative of how the 2017 might develop [although the vintage conditions were highly contrasting]. Today it is all cigar box and savoury blackcurrant flavours. 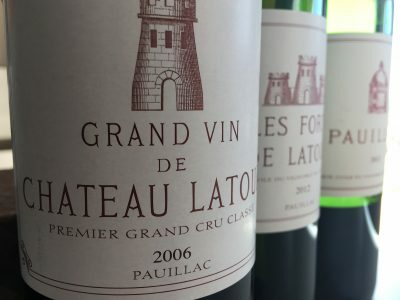 For the grand vin it was the turn of the 2006 Château Latour. While it is perhaps not up there with the 2000, 2005 and 2003 tasted recently it is certainly in par with 2004, if not better, which I rated pretty highly. Mature but with a long life ahead of it, this is a 2006 with excellent levels of extract and structure. 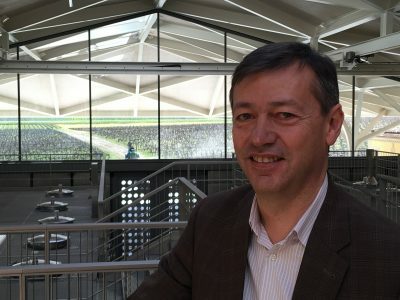 In the afternoon I met up with Philippe Bascaules who has returned to Château Margaux to work as managing director. Philosophically Phillippe continues Paul Pontallier’s work here. 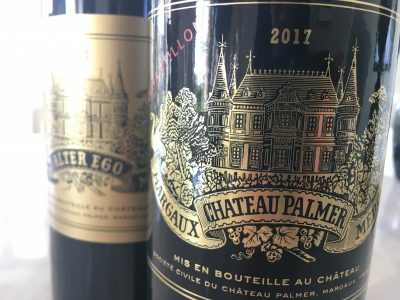 The 2017 Pavillon Rouge looks bright and attractive while the Pavillon Blanc is knockout. What a great year 2017 appears to be for the whites I’ve tasted. The grand vin has wonderful perfume as you would expect, with fine structure and excellent length. What lovely Cabernet this terroir produces. Stylistically Bascuales sees the vintage between 2012 and 2014 for the reds and thinks it might even resemble the 1996 in the long run. Near neighbour Château Durfort-Vivens was next on the list. This produced wonderful wine in 2016 and the property continues its biodynamic approach in 2017 with an aromatic beauty. Lovely, positive Margaux. Château La Gurgue and Château Ferrière were also attractive and pretty. Their Paulliac property Haut Bages Libéral looks fresh and positive. Overall great stuff from the committed Gonzauge Lurton and team. Just up the road Château Rauzan Ségla has produced a jucier and less stern Margaux than some recent vintages. The aromas are floral with lots of seductive qualities. The core is firm and the structure fine. Then it was back up to Pauillac to make an unscheduled visit at Château Pichon Longueville Comtesse de Lalande. Attractive 2017s here with real delicacy. It is a lovely Cabernet vintage in the north. Pichon Lalande’s grand vin looked in excellent health. More details and scores on all these wines in subsequent posts. 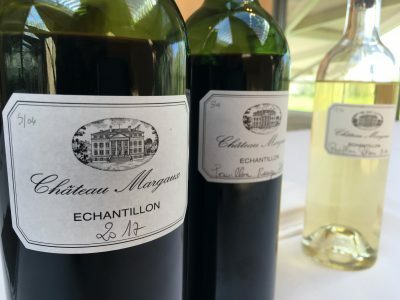 Next up immediate thoughts on day four, which took me to the right bank in St Emilion with tastings at Jean-Luc Thunevin [Château Valandraud et al], Château Canon and Château Canon-la-Gaffelière….